Congregating, cooking and celebrating around food is part of both my Italian and Egyptian heritage. Therefore, when I moved to the U.S. a year ago to start my Ph.D. I was worried I would not be able to find my “food space”. For this reason, before arriving, I researched whether there was a Slow Food (SF) chapter in Phoenix. Having been the president of Slow Food Cairo, and on the board of Slow Food International for several years, I knew I would find people I could connect with in this space. However, I was concerned because some SF chapters are only focused on the elite aspect of food, and of fine dining. The chapters I was engaged in, on the other hand, were about eating pleasurably, but more importantly, they were about culture, traditions, rights and sovereignty. I was pleased to discover that Slow Food Phoenix shared a similar vision. It is currently engaged in many activities, with its flagship project being “Blue Watermelon”, where a group of chefs collaborate with several schools across the valley to educate, and cook with children and teach them about the basics of where their food comes from and how to cook it, and savor it. SF Phoenix is also bringing in new members, including myself, who are able to bring fresh interests and ideas to the table. 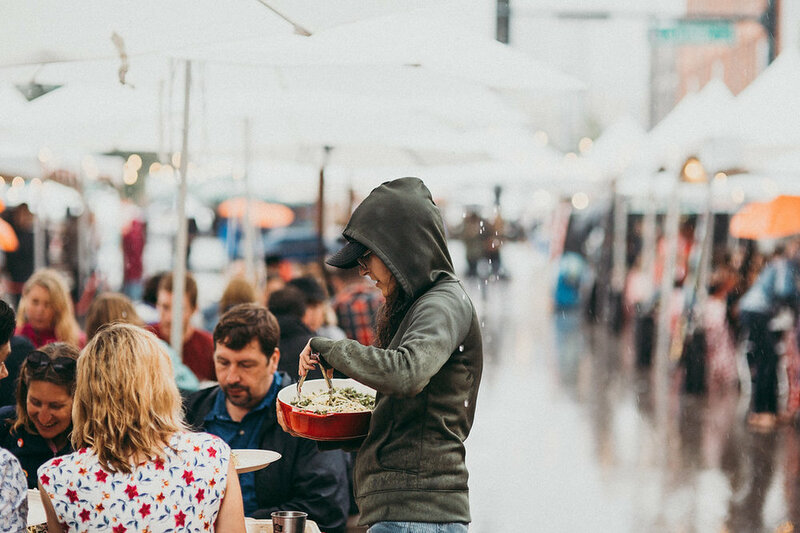 As a current SF Phoenix board member, I was part of team that went to the annual Slow Food Nations event, that took place in Denver, Colorado in July 2018. This annual event brings, scholars, chefs, farmers, fisherfolk, producers and consumers together to discuss what an ethical slow food movement for the United States should look like. This year a new manifesto was being highlighted and brought to center stage, which wants to weave equity, inclusion and justice into issues of food. SF Nations brought more than 20,000 visitors and 200+ speakers and chefs. The speakers included indigenous food activists like Denisa Livingston, a Dine’ (Navajo Nation), who made a call for us to “eat the food our ancestors did” and therefore reconnect with the original people of this land. Also invited were speakers/chefs such as Massimo Bottura, who’s movement in Italy has called for serious action against food waste, as well as creating delicious cuisine for refugees. His belief is that food should be used as a gesture of hospitality and kindness to the refugees, rather than the hate that is currently spread. The most poignant voice was that of Raj Patel, a food activist that highlighted that “capitalism” is in essence destroying our food system. He stated that there is plenty of food today in the world to feed 12 billion people, so it’s not a matter of not having enough food, the system is simply unjust. His premise is that capitalism is about “not paying the bills”, meaning that the capitalist industrial food system which includes labor, raw materials, and the land is just too cheap. Across the value chain the true cost is not really paid, so everything (and everyone) suffers in the middle. Workers, the land, and our health all suffer in the process. The event was not just about political activism, but it was also about enjoying, flavoring and tasting foods. Massimo Bottura and his team made a complete dinner under the rain, made entirely from food that would usually be considered waste. I also did a food tasting with different types of oysters, which was delicious to say the least. There were many food producers who are focusing on regenerative agriculture as well as safeguarding local indigenous seeds and trying to connect to their local consumers. In the end, the event had several calls to action and takeaway, to promote good, clean and fair food and to push for an agenda of more inclusion, equity and justice. Below are a few. Engaging in activities that are more inclusive, and working especially with communities of color, who are negatively impacted in a disproportionate manner, due to the industrialized food system. Resistance to the industrialization of food and eating from both local producers, as well as also small-scale conscious producers, that care for their land, animals and people. Pushing for legislation that protect our food choices, our land, our farmers and our health, such as pushing for a tax on soda. Piloting a "community food utility", treating good, nutritious food as a "right" for all, and therefore having a minimum that each community should be consuming in terms of food, treating it as one of the utilities and managing it by means of a cooperative system. Promoting small-scale campaigns that promote good, clean and fair food. These include, “Throwback Thursday”, which encourages us to eat what our ancestors ate, and get to know native American food traditions. “Meatless Monday”, a call to decrease meat consumption; given that the U.S. is the highest consumer of meat globally, as well as encouraging us to be conscious of where our meat comes from and how it is farmed. The event got me really pumped to play a more active role in the local food movement in Arizona, as well as in the U.S. I strongly believe in many of Raj Patel’s messages, of fighting the system and not accepting the status quo, and valorising our lands, food and people. (Raj will be visiting our campus in November, so keep your eyes out for event posters) I hope to explore the indigenous flavors of Arizona, a land with many indigenous tribes. I also hope to play a more active role here at ASU, to raise awareness about these important topics. Given how large ASU is, I think that some of the small campaigns such as “Meatless monday” could have a large impact, so join me in bringing these actions to life. Mass protests and marches have always been a staple in this country, but the past year has seen a spike in this kind of political activity, especially in nationwide rallies like the Women’s March and March for Science. Guest writer Jessica Swarner talked to some people who attended marches like these and asked how it affected their lives going forward. Drylab 2023 was a month long project of Arizona State University where eight students, pursuing a mixture of art and sustainability degrees, were permitted 4 gallons of water per person per day to learn how they would govern limited shared resources in a water-scarce world. In April 2017, nearly 200 stakeholders from the Arizona food sector were brought together to develop a roadmap for the activities of the next five years for the state's Food & Agriculture Advisory Council. Editorial board member Marley Halter got the scoop. Meet your local food industry experts in this series of short interviews from the conference. Held in November, 2016, Dinner 2040 was a gathering of community members, professionals, and academics that worked to create a vision for Phoenix's food future. We asked protesters at the Phoenix Women's March how the Trump administration will handle climate change. The project will allow ASU to increase by 150 percent the amount of renewable energy it generates per year, which is well over its existing portfolio. By The Sustainability Review Some ways to think about crafting a script for your SciVO. The Interactive Atlas of the San Miguel is a mediated sculptural display that allows users to interact with informational layers (pictures, texts, maps, stream data, etc.) and contribute "stories of place" focused on the San Miguel River Watershed in Southwestern Colorado. The project in its current form is a prototype for a network of interactive stations situated in publically accessible institutions and facilities (libraries, schools, museums, general stores, etc.) along the length of the San Miguel River. As you may have read, we at The Sustainability Review recently had the good fortune of speaking with Dr. Karen Seto, Associate Professor of the Urban Environment at the Yale School of Forestry and Environmental studies, on her research related to urbanization in China and India. In our first piece, we discussed the implications, drivers and challenges of global scale urbanization in China and India. In this edited portion of our conversation, we look to the future and discuss the obstacles to and opportunities for urban sustainability. The Sun Corridor, as the "New Heartland" of Arizona, has gathered unprecedented momentum in recent decades. It is one of ten megapolitan regions in the country and encompasses a total of four metropolitan areas in Arizona: Phoenix, Tucson, Prescott and Nogales. The primary purpose of the development of this corridor has been to link together cities, towns, villages and counties based on "goods movement, business linkages, cultural commonality and physical environments" (1). Several reports observe growth, recent trends and emerging industries in the region. However, a micro-level blueprint for a synergistic corridor product that can strongly tie the metropolitan areas together in a multi-sector, unified approach and provide opportunities and prosperity to the region and overall state is still lacking. This opinion piece suggests a present-centered heritage corridor paradigm to promote heritage tourism in the region. We at The Sustainability Review recently had the good fortune of speaking with Dr. Karen Seto, Associate Professor of the Urban Environment at the Yale School of Forestry and Environmental studies, on her research related to urbanization in China and India. According to her official bio, Dr. Seto’s research focuses on four themes touching on human land-use transformation: its nature, impacts, implications, and potential future manifestations. In this first part of our edited transcript, we discuss aspects and drivers of urbanization in China and India. In the second part (forthcoming in Features), we look to the future and discuss challenges and opportunities for urban sustainability.